Purpose The VLCC Anti-ageing Chocolate Facial pampers your skin boosts collagen formation & offers quick skin firming, Antioxidents present in chocolate help in reducing visible signs of ageing detoxifying and toning it to leave it with a youthful glow. Benefits of chocolate in beauty formulation are known for time immortal. This chocolate scrub is designed for deep cleansing its purifying properties offer a refreshed and soft feel to the skin leaving the skin feeling pampered. It has fine chocolate grains and walnut powder which helps to remove dead skin cells & superficial black/white heads while cleansing the deep pores. 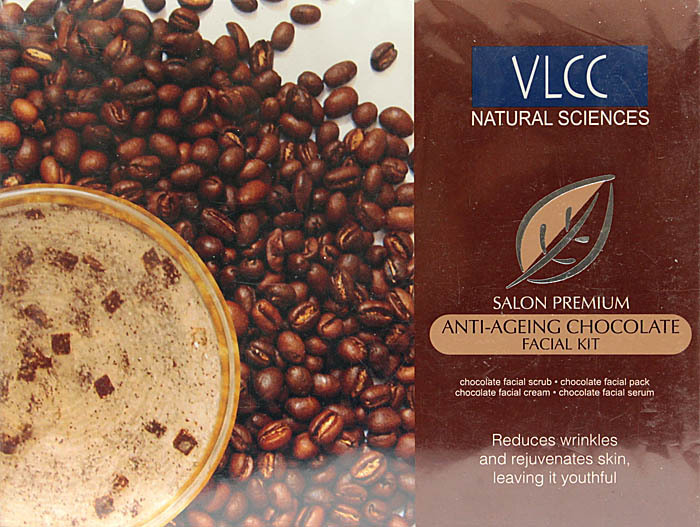 Direction: To start the VLCC Anti-Ageing Chocolate facial take appropriate amount of this scrub and apply all over the face. Scrub gently with circular movements for at least 5 minutes. Apply pressure on the dark chocolate pieces to release their aromatic sensorial experience & antioxidants wipe of with damp cotton. Key Ingredients: wheat germ Oil, Cocoa Butter, Cellulose, Walnut Shell powder, Almond Oil Vitamin E.
One of the proven benefits of using chocolate on the skin is that it has powerful anti-ageing properties. The cocoa bean has a fibrous coating which breaks down harmful free radicals which cause wrinkles. The fatty cocoa butter hydrates and softens. This energizing pack moisturizes rejuvenates the skin reduces blemishes leaving it even toned. Cocoa powder along with Cocoa butter moistruises skin boost collagen formation to even out the age lines. Directions: As the second step of the VLCC Anti-Ageing Chocolate Facial take this chocolate pack on your finger tips and apply in the form of a pack all over the face and neck avoiding the eye area. Keep it on until dry wash with water pat dry. VLCC Chocolate Cream’s active bioflavonoids act as an effective antioxidant and protect free radical formation in skin cells eventually slowing down the signs of ageing. The rejuvenating effect of chocolate along with Cocoa butter, Jojoba Oil, Almond Oil and Milk Proteins detoxifies the skin and provides a glowing complexion and visibly youthful after a good massage with this cream. Directions: As the third step of the VLCC chocolate Anti-Ageing facial take an appropriate amount of Chocolate Cream on your finger tips and apply all over the face and neck with light circular upward movement till it gets completely absorbed in the skin. Chocolate serum is useful to refresh rejuvenate & energizing the skin. The active bioflavonoid antioxidant factor imparts a youthful look. The chocolate serum replenishes, smoothness & restores toned with immediate tightening effect. Directions: To Complete the VLCC Anti-Ageing Chocolate facial take appropriate amount of serum and apply all over the face & neck. Massage gently with fingertips till it gets absorbed. Key Ingredients: Trehlose, Cocoa Butter, Palmitoyl Tripeptide, Cocoa Powder, Vitamin E, Hydroxypropyltrimonium Chloride.